I would like to add a washing machine (and dryer) to my split-level home so that I can rent out the basement below (which already has its own washer/dryer). I don't have the experience to do it myself, but I'd like help deciding if my preferred location for the washer is feasible before seeking help. I would like to run the drain pipe from the washer up into the ceiling of the level below, then down into the wall of the kitchen below and into the drain. Is this feasible? If so, can the p trap and venting be located as per the sketch or must they be located closer to the washer? It would be very difficult to vent the piping near the washer as there is no existing plumbing there and there is another floor above. It is my understanding that the p trap should not be more than 5 feet from the venting, so I suspect it would not work to locate the p trap by the washer. Furthermore, doing this would increase the height the water needs to travel before dropping into the ceiling to a total of at least 60", which my research indicates is possible, but not ideal. Can anyone confirm or deny the feasibility of the layout in my sketch and/or offer other suggestions? The discharge water is too high above the machine. The vent stack is too far from the machine. We haven't bought the washer yet so using a front loader on a 3' pedestal is a possibility. I guess this would solve problem #1. Problem #2 however, may make this setup unfeasible. The only solution to this might be venting out the exterior wall, which is adjacent to the washer. I understand that this isn't ideal but could it work if the vent stack exits through the wall at a 45 degree angle? To do this right, you'll likely have to install a whole drain system for the washer. You'll install a new vent (according to local codes), and a new drain line that attaches to the existing drainage system (in a code compliant way). Then you'll install a standpipe with a trap, that the washer can discharge to. Not the answer you're looking for? Browse other questions tagged plumbing washing-machine or ask your own question. Can a modern washing machine pump high enough to reach a sewer line that's 43" above the ground? How long can a sink drain be? How can I stop my washing machine drain from overflowing? Can I use the original drain line after I move my washing machine twenty feet away? Why would it matter whether a front-loading washer is upstairs? How can I find out why my washing machine trips the outlet? Can the high efficiency washing machine drain into the kitchen waste stack? 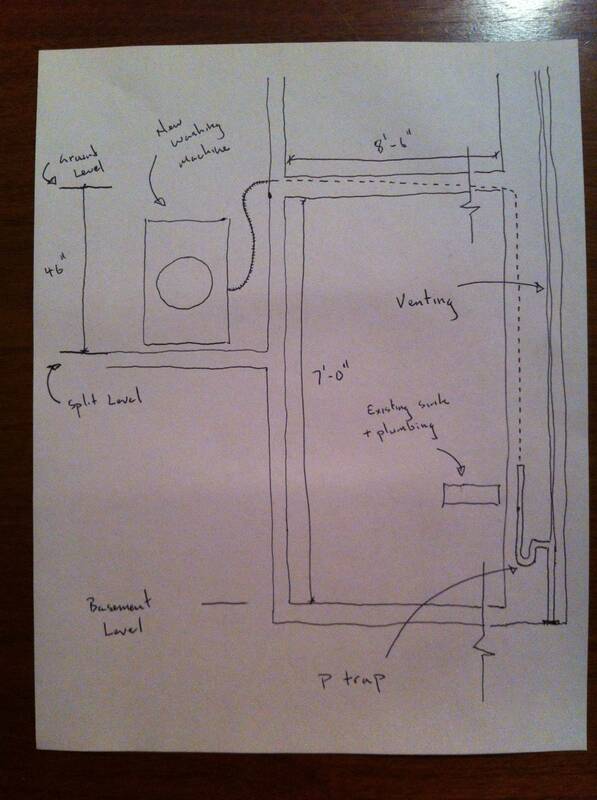 Where should I expect to find the trap for my in-wall washing machine drain?